Peachjar’s K-12 parent engagement platform has transformed and digitized the paper flyer business in over 10,000 U.S. schools, now bringing information about youth enrichment programs via email to parents across the country. With a leadership team savvy in both starting and scaling companies, Peachjar announced today that it will formalize its Entrepreneur in Residence (EIR) program, the pilot for which has just been completed. The program focuses on incubating youth impact organizations whom the Peachjar management team sees as having high potential for delivering impact in their communities. 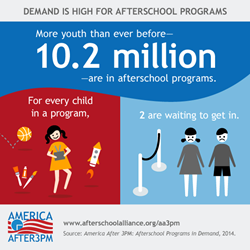 With 11.3 million kids left alone or unsupervised from 3-6 pm each day, and only 1 out of 3 kids getting into afterschool programs due to limited availability*, Peachjar is serious about taking a role in addressing these gaps. ATAK College Consulting's EIR rotation culminated with a presentation by Tallman and her cofounders to the Peachjar staff in a mock investor forum which was dubbed ‘Peachtank’. Peachjar employees grilled ATAK College Consulting with questions, then graded them on their overall presentation and the viability of their business model. ATAK College Consulting wound up walking away with the equivalent of $2,000 worth of Peachjar marketing credits to use to reach parents across the country, an incredible way to kick off their summer marketing campaign! Peachjar will be announcing a call for applications for its next EIR program in April.